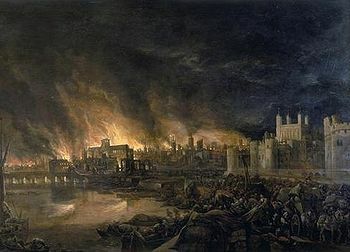 This last week marked the 347th anniversary of one of London’s largest catastrophes, The Great Fire of London. Although the loss of life was minimal (some say only 16 peopled perished) the enormity of the property loss was astounding. Around 430 acres were charred and as much as 80% of the city was destroyed including 13,000 houses, 89 churches, and 52 Guild Halls! Thousands of citizens found themselves homeless and financially ruined. There were at least two positive outcomes: the new city ordinance that required buildings be made of brick and the reduction of the plague virus. Whether this reduction of the virus was a result of a mass rat die off or a cleansing by fire (so long human and animal waste) is still debated. It most likely was a combination of the two. I bring the fire up because of a conversation I had with two co-workers this last week. We were discussing the importance of history as it relates to fire (Forest Service workers are always discussing fire) when I mentioned the London fire. One of my co-workers perked up and said, “oh yeah, that’s the one that got started by Mrs. O’Leary’s cow”. “No”, I said slowly. “You are thinking of the Chicago fire of 1893”. Prior to the fire London was an overpopulated, poorly planned and very cramp city. The population was close to half a million and growing. Many of the inner streets and alleys were catastrophically narrow. One could stand in the middle and touch both buildings on either side. Buildings were constructed of dry timber, waddle and daub and so were easily ignitable. Many houses had stacks of hay behind them and all had waste material running down the front. For years there had been warnings of London’s total destruction by fire. In April 1665, King Charles II had warned the Mayor of London of the possible danger caused by the narrow streets and overhanging timber houses. To make matters worse, a long, hot summer had left London dry and drought had left it with a dwindling water reserves. This was a fire waiting to happen. 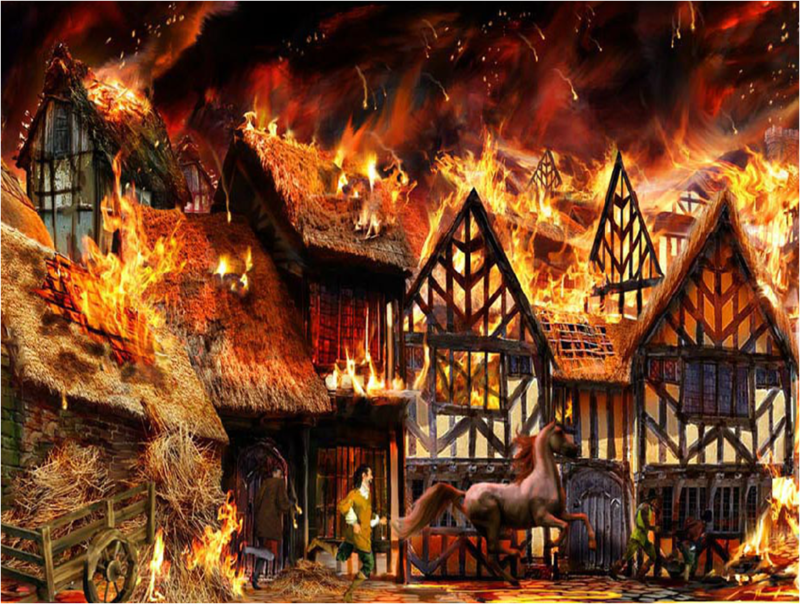 The Great Fire of London began on the night of September 2, 1666, as a small fire on Pudding Lane, in the bakeshop of Thomas Farynor, baker to the King. A maid had forgotten to put out the ovens. The heat from the ovens ignited the kitchen. At one o’clock in the morning, a servant woke to find the house in flames. The baker and his family escaped, but the maid who had forgotten to put out the ovens died while trying to climb out of the burning building. What could have been a very localized fire quickly grew out of control due to strong winds that pushed it through the first street. The fire jumped to the hay and feed piles on the yard of the Star Inn at Fish Street Hill, and spread to the Inn. The strong winds that blew that night sent sparks that ignited the Church of St. Margaret, and then spread to Thames Street, with its riverside warehouses and wharves filled with more fuel for the fire: hemp, oil, tallow, hay, timber, coal along with other combustibles. The citizen firefighting brigades had little success in containing the fire with their buckets of water from the river. By eight o’clock in the morning, the fire had spread halfway across London Bridge. The only thing that stopped the fire from spreading to Southwark, on the other side of the river, was the gap in the bridge that had been caused by the fire of 1633. The standard procedure at that time to stop a fire from spreading was to to destroy the buildings that sat in the path of the flames, creating “fire-breaks”, depriving a fire of more fuel. But Mayor Bludworth, was hesitant, worrying about the cost of rebuilding. By the time an official order came down it was too late. The fire was too massive to control. A group of Londoners, trained in the use of gunpowder demolition were told to destroy some houses only to find they had no time to clear the rubble. These woodpiles added fuel to the fire. So how did they stop it? As it raged towards Westminster the Duke of York made a snap decision that would save the city. He had the paper warehouses pulled down and removed before the fire got to them. This created the much needed fire break. As I mentioned before, there were positive outcomes to the fire. King Charles II appointed commissioners to redesign the city. The plan specified for wider streets and buildings made of brick. By 1671, 9000 houses and public buildings had been rebuilt. Sir Christopher Wren was commissioned to design and oversee the construction of nearly 50 new churches that were lost in the fire, not least of them a new St. Paul’s Cathedral. 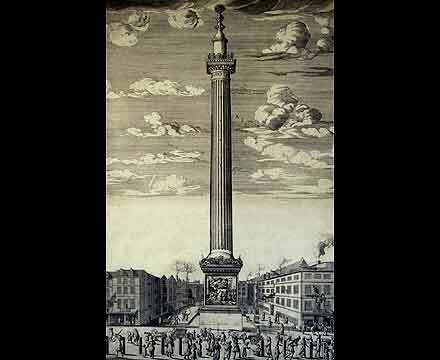 The King asked Wren design a monument to the Great Fire. You can find it today at the site of the bakery that started it all, on a street renamed Monument Street. The first official London fire brigades were named Insurance Brigades. They were formed by insurance companies looking for cost effective measures against large fires. “A woman can piss this out”. The Mayor’ upon hearing of the fast moving fire. I cannot be certain this is a factual statement, though most of what I have read about the fire claims it to be so. I think it may be a myth brought about by his apparent inept handling of the fire. I saw a fire as one entire arch of fire above a mile long: it made me weep to see it. The churches, houses are all on fire and flaming at once, and a horrid noise the flames made and the cracking of the houses.” Samuel Pepys’ diary from the event. Sadly here in the States we continue to build wooden houses on top of each other. The suburbs are long stretches of densely packed wooden homes, thought to be safe because of “flame resistant” roofs. And don’t get me started on those who think nothing of building huge wooden homes in the middle of our forests and then cry when a wildfire destroys them. These are the people who keep me employed. Very entertaining and informative, thanks Sari! It’s good to learn something new about what seems familiar, for example I hadn’t known about the 1633 fire and London Bridge. And I didn’t know you were in the Forest Service: I wouldn’t have guessed, though I knew you were erudite! Thank you> I learned a few things too. I hadn’t known about the bridge either. Yes, my day job is with the Forest Service. It pays the bills until I finish my masters. Or will continue to pay the bills if I don’t get a teaching position. Next Next post: Shakespeare and The Walking Dead- Words, Words, Words!